So far while filming The Amazing Spider-Man 2, director Marc Webb has taken to Twitter daily to share glimpses of the filmmaking process and to drop a few hints along the way. The first month of Tweets was more hint-heavy, giving a ton of possible insight into the plot of the film, but since then, he’s been showing how much he loves making this movie. From Tweets about a Dunder Mifflin takeover of Oscorp to what we got today, Webb is showing fans a bit of his lighter side. But before I explain what I think we’re seeing in part one and two of day 39’s images, check out the Tweets for yourself below. While some have been speculating about some epic chamber that Max Dillon falls down into in order to spark an accidental transformation into Electro, or some sort of glass prison that every movie seems to be housing their villains in these days (see Skyfall, Star Trek Into Darkness, etc…), I’m pretty sure what we’re actually seeing is much simpler, and much more fun, than that. I’m not looking at the picture in any better resolution than you are, but I’m pretty certain the man falling on his back is Webb himself. Thus the second Tweet with the producers looking at each and the caption “Do you still have Raimi’s number?” would be because obviously, the director isn’t supposed to be messing around with stunt mats when he’s supposed to be focused on watching dailies and critiquing the subtleties of Andrew Garfield’s web-slinging form. But Webb isn’t a traditional director. 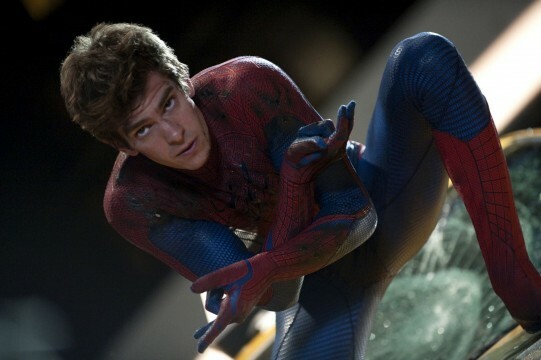 He made his name with an extremely unconventional movie in (500) Days Of Summer, and his unique style carried through into The Amazing Spider-Man, which is part of what made that film so good. What I like most about tonight’s photos, and the ones Webb has been Tweeting throughout production, is they show that he isn’t taking for granted the fact he has the greatest job in the world. I mean he’s directing a Spider-Man movie. I think the only thing greater than directing Spidey is actually playing Spider-Man, but unfortunately Andrew Garfield isn’t on Twitter (or at least isn’t verified), so we’ll have to all go through Webb for the time being. What do you think of these images from the set of The Amazing Spider-Man 2? Is there some hidden message I’m missing, or is Webb simply showing the fun he gets to have on set? Share your thoughts in the comments section below.